There is a vehicle out there as unique as you are at Quirk Kia of Manchester, and that vehicle is the new Kia Soul. With three trim levels and a wide variety of customizable options, the Soul gives you the chance to tailor your vehicle to your specific tastes. If style and refinement are what you seek then look no further. The Kia Soul boasts advanced technologies, comfortable design and aesthetically pleasing interior. There is no other vehicle quite like the Soul. With a IIHS Top Saftey Pick and a NHTSA Overall 5-Star safety rating, the Kia Soul stands above the rest and sets the standard for vehicles in its class. At Quirk Kia of Manchester, we offer a wide variety of trims and colors. So come visit us today and test drive a new Kia Soul. Our friendly and professional service staff will assist you throughout the buying process. Lets us know how Quirk works for you! Boasts 30 Highway MPG and 24 City MPG! This Kia Soul delivers a Regular Unleaded I-4 1.6 L/97 engine powering this Manual transmission. CLEAR WHITE, CARPETED FLOOR MAT, Wheels: 16 Alloy. *This Kia Soul Comes Equipped with These Options *Variable intermittent wipers, Urethane Gear Shift Knob, Trip computer, Transmission: 6-Speed Manual, Torsion Beam Rear Suspension w/Coil Springs, Tires: P205/60R16, Tailgate/Rear Door Lock Included w/Power Door Locks, Strut Front Suspension w/Coil Springs, Spare Tire Mobility Kit, Single Stainless Steel Exhaust. * Visit Us Today *For a must-own Kia Soul come see us at Quirk Kia NH, 1300 South Porter Street, Manchester, NH 03103. Just minutes away! Boasts 31 Highway MPG and 26 City MPG! This Kia Soul boasts a Regular Unleaded I-4 1.6 L/97 engine powering this Automatic transmission. OPTION GROUP 010 -inc: standard equipment,, CLEAR WHITE, CARPETED FLOOR MAT. *This Kia Soul Comes Equipped with These Options *BLACK, CLOTH SEAT TRIM -inc: Woven and tricot, Wheels: 16 Alloy, Variable intermittent wipers, Urethane Gear Shift Knob, Trip computer, Transmission: 6-Speed Automatic w/Sportmatic -inc: active ECO system and drive mode select system (normal, comfort, sport), Remote Keyless Entry, Cruise Control w/Steering-Wheel Mounted Controls, Center Console Armrest, storage, Illuminated Ignition Cylinder Ring, Torsion Beam Rear Suspension w/Coil Springs, Tires: P205/60R16, Tailgate/Rear Door Lock Included w/Power Door Locks, Strut Front Suspension w/Coil Springs. * Stop By Today *Come in for a quick visit at Quirk Kia NH, 1300 South Porter Street, Manchester, NH 03103 to claim your Kia Soul! Delivers 31 Highway MPG and 26 City MPG! This Kia Soul delivers a Regular Unleaded I-4 1.6 L/97 engine powering this Automatic transmission. OPTION GROUP 010 -inc: standard equipment,, CARPETED FLOOR MAT, BRIGHT SILVER. *This Kia Soul Comes Equipped with These Options *BLACK, CLOTH SEAT TRIM -inc: Woven and tricot, Wheels: 16 Alloy, Variable intermittent wipers, Urethane Gear Shift Knob, Trip computer, Transmission: 6-Speed Automatic w/Sportmatic -inc: active ECO system and drive mode select system (normal, comfort, sport), Remote Keyless Entry, Cruise Control w/Steering-Wheel Mounted Controls, Center Console Armrest, storage, Illuminated Ignition Cylinder Ring, Torsion Beam Rear Suspension w/Coil Springs, Tires: P205/60R16, Tailgate/Rear Door Lock Included w/Power Door Locks, Strut Front Suspension w/Coil Springs. * Visit Us Today *Live a little- stop by Quirk Kia NH located at 1300 South Porter Street, Manchester, NH 03103 to make this car yours today! Delivers 31 Highway MPG and 26 City MPG! This Kia Soul delivers a Regular Unleaded I-4 1.6 L/97 engine powering this Automatic transmission. OPTION GROUP 010 -inc: standard equipment,, CARPETED FLOOR MAT, BRIGHT SILVER. * This Kia Soul Features the Following Options *BLACK, CLOTH SEAT TRIM -inc: Woven and tricot, Wheels: 16 Alloy, Variable intermittent wipers, Urethane Gear Shift Knob, Trip computer, Transmission: 6-Speed Automatic w/Sportmatic -inc: active ECO system and drive mode select system (normal, comfort, sport), Remote Keyless Entry, Cruise Control w/Steering-Wheel Mounted Controls, Center Console Armrest, storage, Illuminated Ignition Cylinder Ring, Torsion Beam Rear Suspension w/Coil Springs, Tires: P205/60R16, Tailgate/Rear Door Lock Included w/Power Door Locks, Strut Front Suspension w/Coil Springs. * Stop By Today *Come in for a quick visit at Quirk Kia NH, 1300 South Porter Street, Manchester, NH 03103 to claim your Kia Soul! Scores 31 Highway MPG and 26 City MPG! This Kia Soul boasts a Regular Unleaded I-4 1.6 L/97 engine powering this Automatic transmission. OPTION GROUP 010 -inc: standard equipment,, INFERNO RED, CARPETED FLOOR MAT. *This Kia Soul Comes Equipped with These Options *BLACK, CLOTH SEAT TRIM -inc: Woven and tricot, Wheels: 16 Alloy, Variable intermittent wipers, Urethane Gear Shift Knob, Trip computer, Transmission: 6-Speed Automatic w/Sportmatic -inc: active ECO system and drive mode select system (normal, comfort, sport), Remote Keyless Entry, Cruise Control w/Steering-Wheel Mounted Controls, Center Console Armrest, storage, Illuminated Ignition Cylinder Ring, Torsion Beam Rear Suspension w/Coil Springs, Tires: P205/60R16, Tailgate/Rear Door Lock Included w/Power Door Locks, Strut Front Suspension w/Coil Springs. * Visit Us Today *For a must-own Kia Soul come see us at Quirk Kia NH, 1300 South Porter Street, Manchester, NH 03103. Just minutes away! Delivers 31 Highway MPG and 26 City MPG! This Kia Soul delivers a Regular Unleaded I-4 1.6 L/97 engine powering this Automatic transmission. OPTION GROUP 010 -inc: standard equipment,, CARPETED FLOOR MAT, BRIGHT SILVER. * This Kia Soul Features the Following Options *BLACK, CLOTH SEAT TRIM -inc: Woven and tricot, Wheels: 16 Alloy, Variable intermittent wipers, Urethane Gear Shift Knob, Trip computer, Transmission: 6-Speed Automatic w/Sportmatic -inc: active ECO system and drive mode select system (normal, comfort, sport), Remote Keyless Entry, Cruise Control w/Steering-Wheel Mounted Controls, Center Console Armrest, storage, Illuminated Ignition Cylinder Ring, Torsion Beam Rear Suspension w/Coil Springs, Tires: P205/60R16, Tailgate/Rear Door Lock Included w/Power Door Locks, Strut Front Suspension w/Coil Springs. * Visit Us Today *A short visit to Quirk Kia NH located at 1300 South Porter Street, Manchester, NH 03103 can get you a tried-and-true Soul today! Scores 31 Highway MPG and 26 City MPG! This Kia Soul delivers a Regular Unleaded I-4 1.6 L/97 engine powering this Automatic transmission. OPTION GROUP 010 -inc: standard equipment,, CLEAR WHITE, CARPETED FLOOR MAT. * This Kia Soul Features the Following Options *CARGO NET, BLACK, CLOTH SEAT TRIM -inc: Woven and tricot, Wheels: 16 Alloy, Variable intermittent wipers, Urethane Gear Shift Knob, Trip computer, Transmission: 6-Speed Automatic w/Sportmatic -inc: active ECO system and drive mode select system (normal, comfort, sport), Remote Keyless Entry, Cruise Control w/Steering-Wheel Mounted Controls, Center Console Armrest, storage, Illuminated Ignition Cylinder Ring, Torsion Beam Rear Suspension w/Coil Springs, Tires: P205/60R16, Tailgate/Rear Door Lock Included w/Power Door Locks. * Visit Us Today *Come in for a quick visit at Quirk Kia NH, 1300 South Porter Street, Manchester, NH 03103 to claim your Kia Soul! Boasts 30 Highway MPG and 25 City MPG! This Kia Soul delivers a Regular Unleaded I-4 1.6 L/97 engine powering this Automatic transmission. OPTION GROUP 010 -inc: standard equipment,, CLEAR WHITE, CARPETED FLOOR MAT. * This Kia Soul Features the Following Options *CARGO NET, BLACK, CLOTH SEAT TRIM -inc: Woven and tricot, Wheels: 16 Alloy, Variable intermittent wipers, Urethane Gear Shift Knob, Trip computer, Transmission: 6-Speed Automatic w/Sportmatic -inc: active ECO system and drive mode select system (normal, comfort, sport), Remote Keyless Entry, Cruise Control w/Steering-Wheel Mounted Controls, Center Console Armrest, storage, Illuminated Ignition Cylinder Ring, Torsion Beam Rear Suspension w/Coil Springs, Tires: P205/60R16, Tailgate/Rear Door Lock Included w/Power Door Locks. * Visit Us Today *Treat yourself- stop by Quirk Kia NH located at 1300 South Porter Street, Manchester, NH 03103 to make this car yours today! Boasts 31 Highway MPG and 26 City MPG! This Kia Soul delivers a Regular Unleaded I-4 1.6 L/97 engine powering this Automatic transmission. OPTION GROUP 010 -inc: standard equipment,, GRAY 2-TONE, CLOTH SEAT TRIM -inc: Woven and tricot, CLEAR WHITE. *This Kia Soul Comes Equipped with These Options *CARPETED FLOOR MAT, Wheels: 16 Alloy, Variable intermittent wipers, Urethane Gear Shift Knob, Trip computer, Transmission: 6-Speed Automatic w/Sportmatic -inc: active ECO system and drive mode select system (normal, comfort, sport), Remote Keyless Entry, Cruise Control w/Steering-Wheel Mounted Controls, Center Console Armrest, storage, Illuminated Ignition Cylinder Ring, Torsion Beam Rear Suspension w/Coil Springs, Tires: P205/60R16, Tailgate/Rear Door Lock Included w/Power Door Locks, Strut Front Suspension w/Coil Springs. * Visit Us Today *A short visit to Quirk Kia NH located at 1300 South Porter Street, Manchester, NH 03103 can get you a reliable Soul today! Delivers 31 Highway MPG and 26 City MPG! This Kia Soul boasts a Regular Unleaded I-4 1.6 L/97 engine powering this Automatic transmission. OPTION GROUP 010 -inc: standard equipment,, CARPETED FLOOR MAT, BRIGHT SILVER. *This Kia Soul Comes Equipped with These Options *BLACK, CLOTH SEAT TRIM -inc: Woven and tricot, Wheels: 16 Alloy, Variable intermittent wipers, Urethane Gear Shift Knob, Trip computer, Transmission: 6-Speed Automatic w/Sportmatic -inc: active ECO system and drive mode select system (normal, comfort, sport), Remote Keyless Entry, Cruise Control w/Steering-Wheel Mounted Controls, Center Console Armrest, storage, Illuminated Ignition Cylinder Ring, Torsion Beam Rear Suspension w/Coil Springs, Tires: P205/60R16, Tailgate/Rear Door Lock Included w/Power Door Locks, Strut Front Suspension w/Coil Springs. * Visit Us Today *A short visit to Quirk Kia NH located at 1300 South Porter Street, Manchester, NH 03103 can get you a dependable Soul today! Delivers 31 Highway MPG and 26 City MPG! This Kia Soul boasts a Regular Unleaded I-4 1.6 L/97 engine powering this Automatic transmission. OPTION GROUP 010 -inc: standard equipment,, CLEAR WHITE, CARPETED FLOOR MAT. * This Kia Soul Features the Following Options *BLACK, CLOTH SEAT TRIM -inc: Woven and tricot, Wheels: 16 Alloy, Variable intermittent wipers, Urethane Gear Shift Knob, Trip computer, Transmission: 6-Speed Automatic w/Sportmatic -inc: active ECO system and drive mode select system (normal, comfort, sport), Remote Keyless Entry, Cruise Control w/Steering-Wheel Mounted Controls, Center Console Armrest, storage, Illuminated Ignition Cylinder Ring, Torsion Beam Rear Suspension w/Coil Springs, Tires: P205/60R16, Tailgate/Rear Door Lock Included w/Power Door Locks, Strut Front Suspension w/Coil Springs. * Stop By Today *Test drive this must-see, must-drive, must-own beauty today at Quirk Kia NH, 1300 South Porter Street, Manchester, NH 03103. Delivers 31 Highway MPG and 26 City MPG! This Kia Soul boasts a Regular Unleaded I-4 1.6 L/97 engine powering this Automatic transmission. SHADOW BLACK, OPTION GROUP 010 -inc: standard equipment,, CARPETED FLOOR MAT. *This Kia Soul Comes Equipped with These Options *BLACK, CLOTH SEAT TRIM -inc: Woven and tricot, Wheels: 16 Alloy, Variable intermittent wipers, Urethane Gear Shift Knob, Trip computer, Transmission: 6-Speed Automatic w/Sportmatic -inc: active ECO system and drive mode select system (normal, comfort, sport), Remote Keyless Entry, Cruise Control w/Steering-Wheel Mounted Controls, Center Console Armrest, storage, Illuminated Ignition Cylinder Ring, Torsion Beam Rear Suspension w/Coil Springs, Tires: P205/60R16, Tailgate/Rear Door Lock Included w/Power Door Locks, Strut Front Suspension w/Coil Springs. * Visit Us Today *A short visit to Quirk Kia NH located at 1300 South Porter Street, Manchester, NH 03103 can get you a dependable Soul today! Scores 31 Highway MPG and 26 City MPG! This Kia Soul boasts a Regular Unleaded I-4 1.6 L/97 engine powering this Automatic transmission. OPTION GROUP 010 -inc: standard equipment,, INFERNO RED, CARPETED FLOOR MAT. *This Kia Soul Comes Equipped with These Options *BLACK, CLOTH SEAT TRIM -inc: Woven and tricot, Wheels: 16 Alloy, Variable intermittent wipers, Urethane Gear Shift Knob, Trip computer, Transmission: 6-Speed Automatic w/Sportmatic -inc: active ECO system and drive mode select system (normal, comfort, sport), Remote Keyless Entry, Cruise Control w/Steering-Wheel Mounted Controls, Center Console Armrest, storage, Illuminated Ignition Cylinder Ring, Torsion Beam Rear Suspension w/Coil Springs, Tires: P205/60R16, Tailgate/Rear Door Lock Included w/Power Door Locks, Strut Front Suspension w/Coil Springs. * Visit Us Today *You've earned this- stop by Quirk Kia NH located at 1300 South Porter Street, Manchester, NH 03103 to make this car yours today! Boasts 31 Highway MPG and 26 City MPG! This Kia Soul delivers a Regular Unleaded I-4 1.6 L/97 engine powering this Automatic transmission. OPTION GROUP 010 -inc: standard equipment,, CARPETED FLOOR MAT, BRIGHT SILVER. *This Kia Soul Comes Equipped with These Options *BLACK, CLOTH SEAT TRIM -inc: Woven and tricot, Wheels: 16 Alloy, Variable intermittent wipers, Urethane Gear Shift Knob, Trip computer, Transmission: 6-Speed Automatic w/Sportmatic -inc: active ECO system and drive mode select system (normal, comfort, sport), Remote Keyless Entry, Cruise Control w/Steering-Wheel Mounted Controls, Center Console Armrest, storage, Illuminated Ignition Cylinder Ring, Torsion Beam Rear Suspension w/Coil Springs, Tires: P205/60R16, Tailgate/Rear Door Lock Included w/Power Door Locks, Strut Front Suspension w/Coil Springs. * Stop By Today *A short visit to Quirk Kia NH located at 1300 South Porter Street, Manchester, NH 03103 can get you a trustworthy Soul today! Delivers 31 Highway MPG and 26 City MPG! This Kia Soul boasts a Regular Unleaded I-4 1.6 L/97 engine powering this Automatic transmission. GRAY 2-TONE, CLOTH SEAT TRIM -inc: Woven and tricot, CARPETED FLOOR MAT, Wheels: 16 Alloy. * This Kia Soul Features the Following Options *Variable intermittent wipers, Urethane Gear Shift Knob, Trip computer, Transmission: 6-Speed Automatic w/Sportmatic -inc: active ECO system and drive mode select system (normal, comfort, sport), Remote Keyless Entry, Cruise Control w/Steering-Wheel Mounted Controls, Center Console Armrest, storage, Illuminated Ignition Cylinder Ring, Torsion Beam Rear Suspension w/Coil Springs, Tires: P205/60R16, Tailgate/Rear Door Lock Included w/Power Door Locks, Strut Front Suspension w/Coil Springs, Spare Tire Mobility Kit, Single Stainless Steel Exhaust. * Visit Us Today *Test drive this must-see, must-drive, must-own beauty today at Quirk Kia NH, 1300 South Porter Street, Manchester, NH 03103. Boasts 31 Highway MPG and 26 City MPG! This Kia Soul delivers a Regular Unleaded I-4 1.6 L/97 engine powering this Automatic transmission. OPTION GROUP 010 -inc: standard equipment,, GRAY 2-TONE, CLOTH SEAT TRIM -inc: Woven and tricot, CLEAR WHITE. * This Kia Soul Features the Following Options *CARPETED FLOOR MAT, Wheels: 16 Alloy, Variable intermittent wipers, Urethane Gear Shift Knob, Trip computer, Transmission: 6-Speed Automatic w/Sportmatic -inc: active ECO system and drive mode select system (normal, comfort, sport), Remote Keyless Entry, Cruise Control w/Steering-Wheel Mounted Controls, Center Console Armrest, storage, Illuminated Ignition Cylinder Ring, Torsion Beam Rear Suspension w/Coil Springs, Tires: P205/60R16, Tailgate/Rear Door Lock Included w/Power Door Locks, Strut Front Suspension w/Coil Springs. 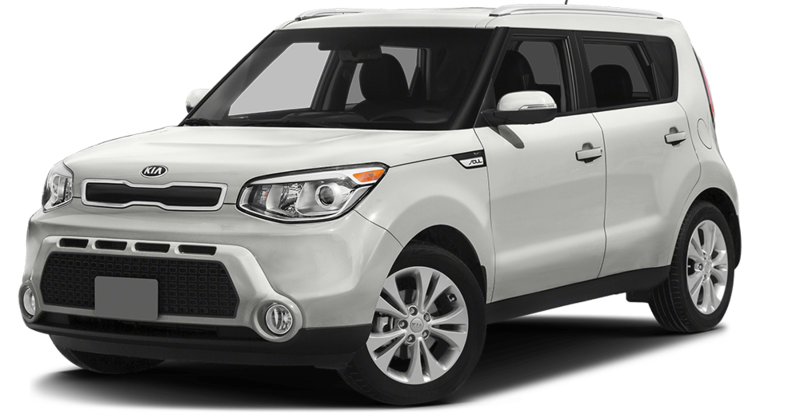 * Visit Us Today *For a must-own Kia Soul come see us at Quirk Kia NH, 1300 South Porter Street, Manchester, NH 03103. Just minutes away! Scores 31 Highway MPG and 26 City MPG! This Kia Soul boasts a Regular Unleaded I-4 1.6 L/97 engine powering this Automatic transmission. OPTION GROUP 010 -inc: standard equipment,, CLEAR WHITE, CARPETED FLOOR MAT. * This Kia Soul Features the Following Options *BLACK, CLOTH SEAT TRIM -inc: Woven and tricot, Wheels: 16 Alloy, Variable intermittent wipers, Urethane Gear Shift Knob, Trip computer, Transmission: 6-Speed Automatic w/Sportmatic -inc: active ECO system and drive mode select system (normal, comfort, sport), Remote Keyless Entry, Cruise Control w/Steering-Wheel Mounted Controls, Center Console Armrest, storage, Illuminated Ignition Cylinder Ring, Torsion Beam Rear Suspension w/Coil Springs, Tires: P205/60R16, Tailgate/Rear Door Lock Included w/Power Door Locks, Strut Front Suspension w/Coil Springs. * Visit Us Today *You've earned this- stop by Quirk Kia NH located at 1300 South Porter Street, Manchester, NH 03103 to make this car yours today! Delivers 31 Highway MPG and 26 City MPG! This Kia Soul delivers a Regular Unleaded I-4 1.6 L/97 engine powering this Automatic transmission. OPTION GROUP 010 -inc: standard equipment,, GRAY 2-TONE, CLOTH SEAT TRIM -inc: Woven and tricot, CARPETED FLOOR MAT. *This Kia Soul Comes Equipped with These Options *BRIGHT SILVER, Wheels: 16 Alloy, Variable intermittent wipers, Urethane Gear Shift Knob, Trip computer, Transmission: 6-Speed Automatic w/Sportmatic -inc: active ECO system and drive mode select system (normal, comfort, sport), Remote Keyless Entry, Cruise Control w/Steering-Wheel Mounted Controls, Center Console Armrest, storage, Illuminated Ignition Cylinder Ring, Torsion Beam Rear Suspension w/Coil Springs, Tires: P205/60R16, Tailgate/Rear Door Lock Included w/Power Door Locks, Strut Front Suspension w/Coil Springs. * Stop By Today *For a must-own Kia Soul come see us at Quirk Kia NH, 1300 South Porter Street, Manchester, NH 03103. Just minutes away! Boasts 31 Highway MPG and 26 City MPG! This Kia Soul boasts a Regular Unleaded I-4 1.6 L/97 engine powering this Automatic transmission. SHADOW BLACK, OPTION GROUP 010 -inc: standard equipment,, GRAY 2-TONE, CLOTH SEAT TRIM -inc: Woven and tricot. *This Kia Soul Comes Equipped with These Options *CARPETED FLOOR MAT, Wheels: 16 Alloy, Variable intermittent wipers, Urethane Gear Shift Knob, Trip computer, Transmission: 6-Speed Automatic w/Sportmatic -inc: active ECO system and drive mode select system (normal, comfort, sport), Remote Keyless Entry, Cruise Control w/Steering-Wheel Mounted Controls, Center Console Armrest, storage, Illuminated Ignition Cylinder Ring, Torsion Beam Rear Suspension w/Coil Springs, Tires: P205/60R16, Tailgate/Rear Door Lock Included w/Power Door Locks, Strut Front Suspension w/Coil Springs. * Visit Us Today *Test drive this must-see, must-drive, must-own beauty today at Quirk Kia NH, 1300 South Porter Street, Manchester, NH 03103. Quirk Kia of Manchester makes every effort to present information that is accurate. However, Quirk Kia of Manchester is not responsible for any errors or omissions. Picture may not represent actual vehicle. 0 cash down offers require only fees due at signing, KMF lease acq. fee, dealer doc fee, tags and first payment. All pricing includes all available rebates including Military Appreciation, Quirk Trade In Assistance, Kia Motor Company Rebates, Kia Motor Finance Rebates, and Quirk Discounts. Pricing based off Tier 1 Lease score, 720 FICO score with approved credit with KMF and 10K miles per year. 0% financing, in lieu of certain rebates, requires approved credit with KMF, and can not be combined with advertised pricing. Various offers can not be combined. All New 2019 Stinger, Cadenza and 2020 Telluride pricing also includes an Owner Loyalty/Competitive Bonus rebate, which buyers must qualify for. Residency restrictions apply. Must trade a 2010 or newer vehicle. Tax (where applicable), title, registration, and doc. fees are not included in vehicle prices. Dealer installed options are additional. Documentation fee of $399 is not included in price of vehicle Terms and conditions . **With approved credit. Terms may vary. Monthly financing payments are only estimates derived from the vehicle price with a 72-month term 3.9% interest and 30% down payment. Please verify any information in question with Quirk Kia of Manchester by calling us at (603) 505-8870 or by visiting us. *Number of views in last 30 days Based on 2019 EPA mileage ratings. Use for comparison purposes only. Your actual mileage will vary depending on how you drive and maintain your vehicle. Stock#KS3363. Sale Ends 04-30-2019.